POWRi West Midgets Make Final I-44 Riverside Speedway Stop this Saturday! 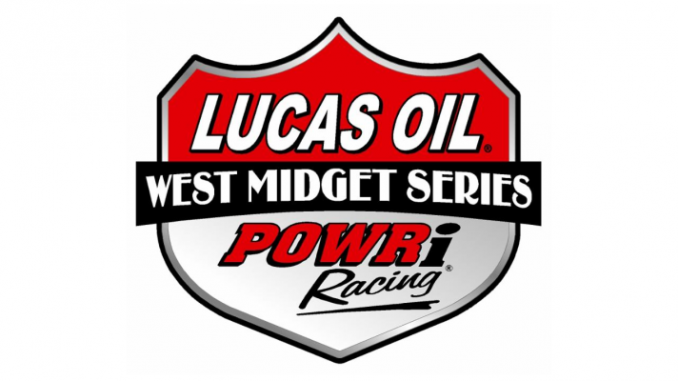 TULSA, Okla. (October 3, 2018) – The Lucas Oil POWRi West Midget League presented by Executive Concrete NWA makes its final stop of the season atop Oklahoma City’s 1/5-mile clay oval I-44 Riverside Speedway at this Saturday night’s “Twister Nationals”. Saturday’s card that goes green at 7:00 p.m. marks the sixth event of the year at I-44 Riverside Speedway for the POWRi West Midgets after last month’s card fell victim to Mother Nature. The 23rd round of competition on the 2018 season for the POWRi West Midget League also marks the ninth round of Sooner Series competition. Bixby’s 15-year-old Cannon McIntosh topped the most recent event at I-44 Riverside Speedway on July 28 after Broken Arrow’s Jonathan Beason topped the previous two features in April and June. Christopher Bell swept the season-opening Turnpike Challenge in March. In total, 15 different drivers have picked off at least on POWRi West feature win through 22 events this season with Beason leading the way with three triumphs. Springfield, Missouri’s Kory Schudy is leading the way in both the overall POWRi West Midget League points as well as the Sooner Series standings. Schudy has a substantial lead in overall POWRi West points over Sand Springs’ 14-year-old Hank Davis with Nixa, Missouri’s Wesley Smith and the Broken Arrow duo of Hannah Adair and Hunter Fischer rounding out the current top five. Adair sits second in Sooner Series points behind Schudy followed by Trey Marcham and Blake Edwards with Fischer and McIntosh tied for fifth. Current Lucas Oil POWRi West Midget League presented by Executive Concrete NWA Top Ten in Points: 1. Kory Schudy (Springfield, MO) 5,230, 2. Hank Davis (Sand Springs, OK) 4,020, 3. Wesley Smith (Nixa, MO) 3,500, 4. Hannah Adair (Broken Arrow, OK) 3,310, 5. Hunter Fischer (Broken Arrow, OK) 2,660, 6. Cannon McIntosh (Bixby, OK) 2,430, 7. Blake Edwards (Claremore, OK) 2,270, 8. Zach Daum (Pocahontas, IL) 2,140, 9. A.J. Burns (Norman, OK) 2,100, 10. Karter Sarff (Mason City, IL) 2,020. Current POWRi West Midget League Sooner Series Top Ten in Points: 1. Kory Schudy (Springfield, MO) 2,050, 2. Hannah Adair (Broken Arrow, OK) 1,540, 3. Trey Marcham (Newcastle, OK) 1,220, 4. Blake Edwards (Claremore, OK) 1,210, 5. (tie) Hunter Fischer (Broken Arrow, OK) and Cannon McIntosh (Bixby, OK) 1,200, 7. (tie) Doug McCune (Colleyville, TX) and Hank Davis (Sand Springs, OK) 1,070, 9. Wesley Smith (Nixa, MO) 1,050, 10. Brendon Wiseley (Sand Springs, OK) 1,040.